The Blanda Station is located in north Iceland, near the Highlands and near the end of Kjalvegur Mountain Road. 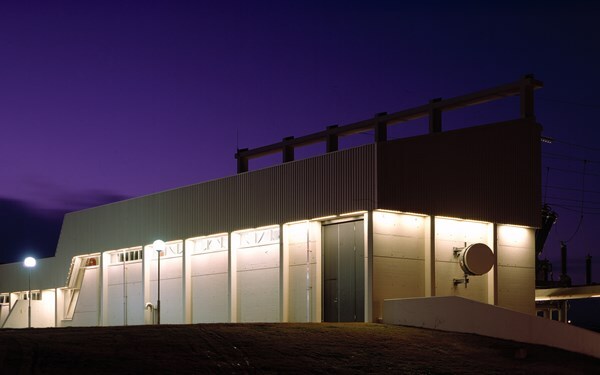 The station started to produce electricity in 1991 – 1992. The Blanda Station is an underground plant, located approximately 230 meters under ground. The capacity from 3 Francis turbines is 3 x 50 MW or total 150 MW, with generation capacity of 910 GWh p.a..
A dam was built in the River Blanda near the Reftjarnarbunga Hill, an ideal area for a reservoir. A dam was also built near the source of the River Kolkukvisl which flowed into River Vatnsdalsa. These dams formed the Blanda Reservoir, which has a live storage capacity of 412 Gl and is the third-largest lake in Iceland. From the Kolka Dam, the water is diverted through diversion canals and lakes on a 25 km long route to the station’s intake reservoir, Gilsarlon. The reservoir has an area of 5 km2 and has a live storage capacity of 20 Gl. From the intake reservoir, water runs through a 1300 m long canal to the station’s intake, where it is diverted to the turbines in the powerhouse. The drop to the turbines from the harnessed head is 287 m. From the turbines, the water is lead through a 1700 m tailrace tunnel back into the river course. The river Blanda flows through grassy fields in the lowlands, but its source is in a region that only a few decades ago was a desert. After the creation of a 56 km2 storage reservoir, extensive revegetation efforts were initiated. Since 1981, Landsvirkjun has cultivated over 5000 hectares at an altitude of 400–600 m by fertiliser treatment and sowing. This is one of the most extensive reclamation projects ever undertaken in Iceland’s highlands. The Blanda Power Station is 43 km distance from The town Blonduos.